Ahoy! I know, not the typical way to start a merchandise review. But if you’re looking for treasures from the high seas, you’re in luck. 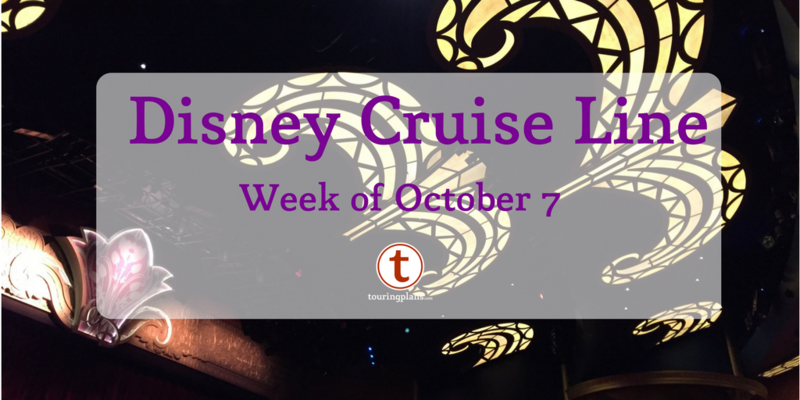 This month, I’m showing the plunder available on the Disney Fantasy on my recent cruise. 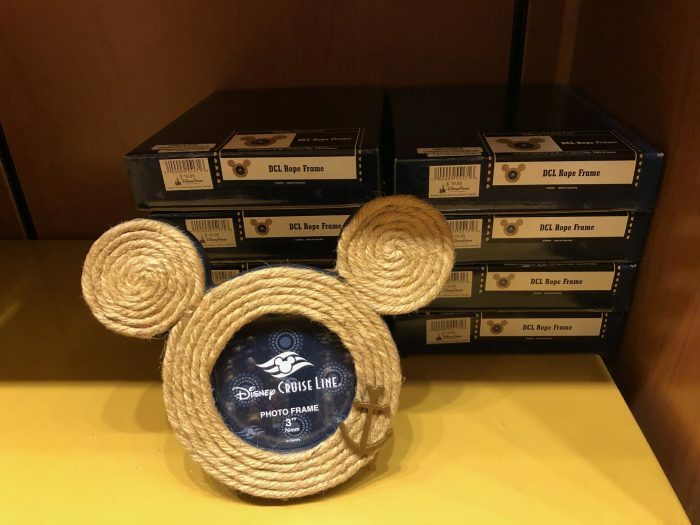 Shipboard merchandise is somewhat limited compared to what you find on land, but there are plenty of awesome finds just waiting to be seen. Let’s dive on it! More often than not, if I’m coming home with a souvenir from a cruise, it has been a Tervis cup. 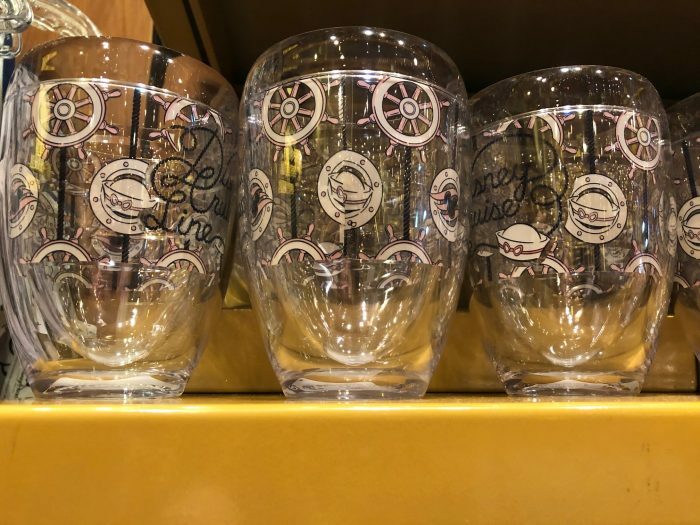 They’re incredibly usable while on board, and with tile floor throughout the house, they’re my drinkware of choice. 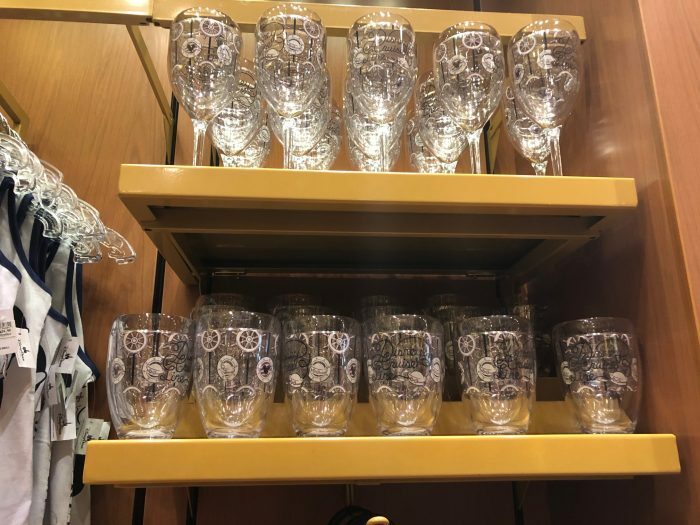 They had “normal” Tervis cups, but also Tervis wine glasses and water cups. Here’s a close-up of the pattern on the water cup. I couldn’t justify buying any more, but I thought about it! 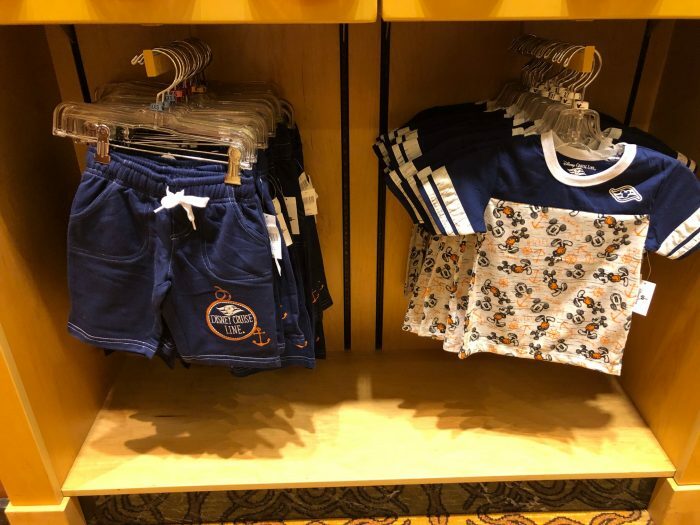 Clothing is also very popular on the cruise. 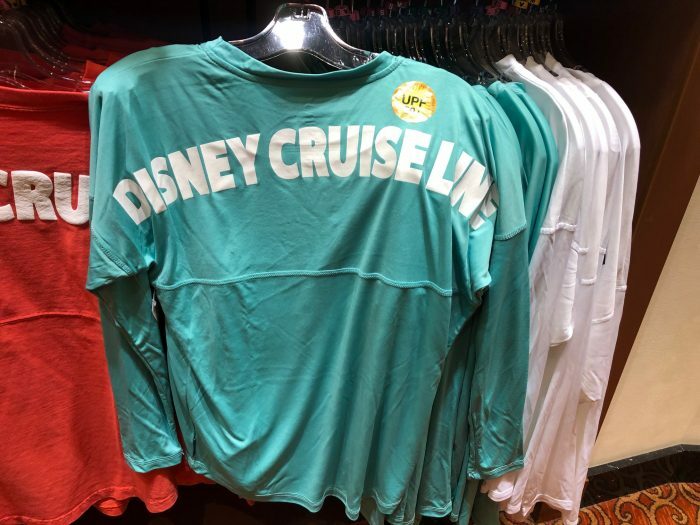 And yes, the spirit jersey trend continues at sea. 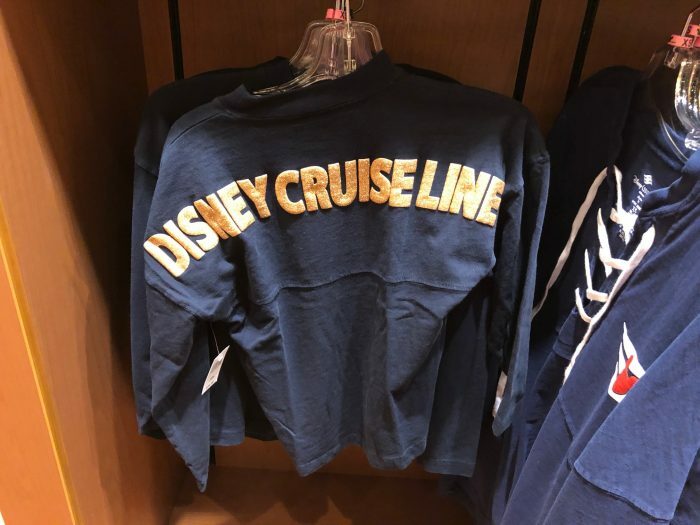 I’ve been reducing my wardrobe at home, and I wouldn’t get much use out of a long-sleeve spirit jersey in Florida, but I really liked the look of this one. 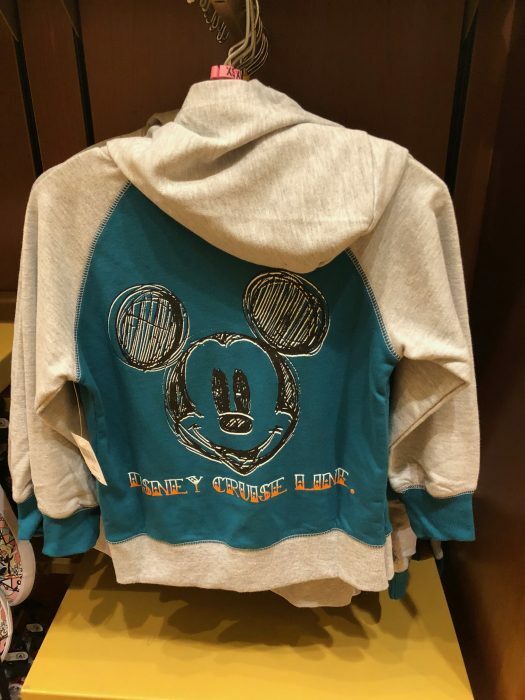 When I first saw this spirit jersey, I wasn’t too thrilled about the look, as it looked more flimsy than the others. Then I realized–it’s a spirit jersey rash guard. What do you think? 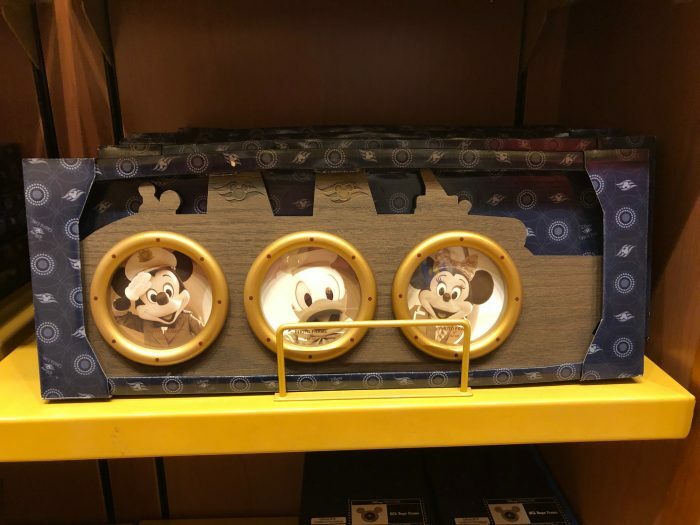 Goofy or great? Also on the trend boat, rose gold is everywhere here as well. 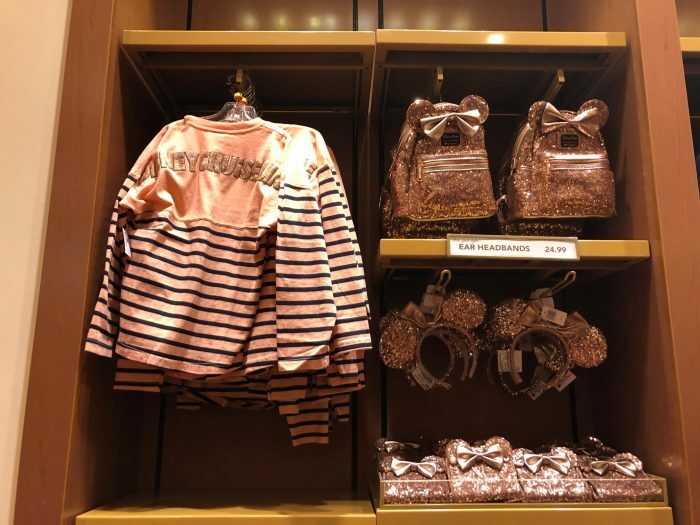 Given the limited amount of room to display items on board, rose gold got an entire section with headbands, backpacks, and (of course) spirit jerseys. 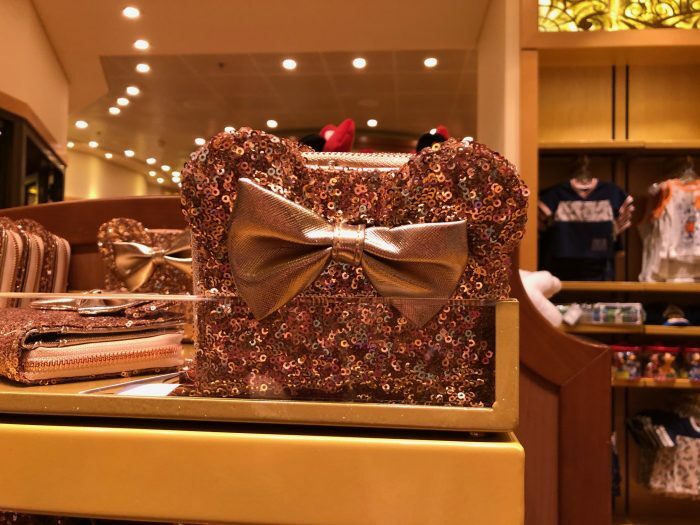 They also had these wallets that I can’t imagine actually using, but if you need the entire rose gold experience…. 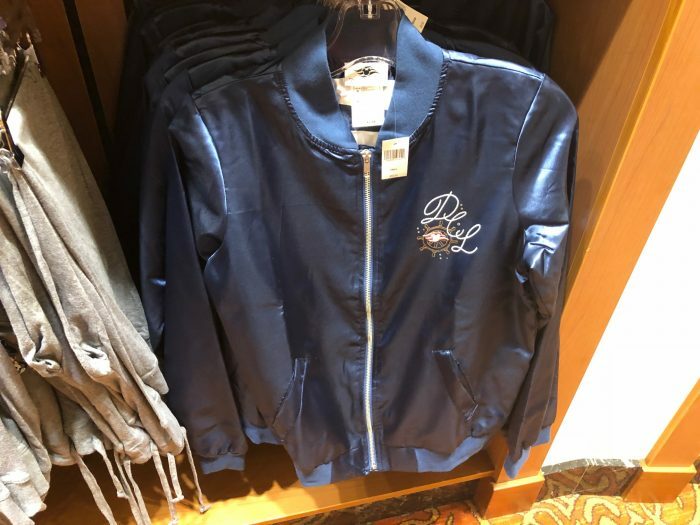 I almost bought this jacket, except they were out of my size, and again, living in Florida means that one jacket will last you for years upon years. I loved the retro design and silky feel, though. 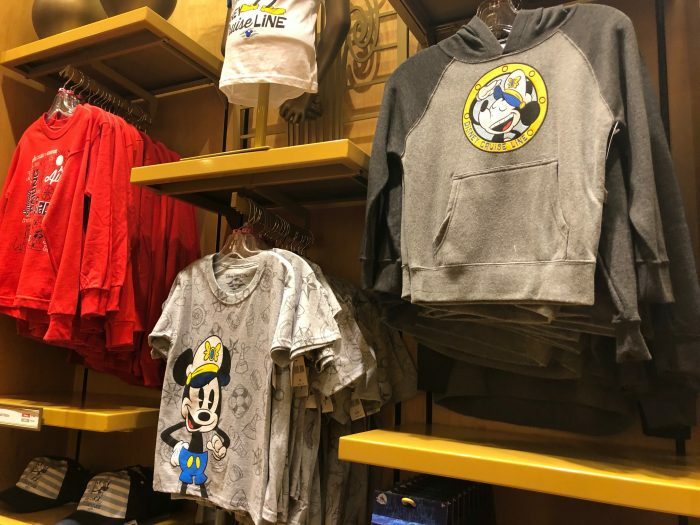 I’m not much of a fan of the I’m in love with the Captain shirt (and Pete was the captain of Steamboat Willie, not Mickey, so….). 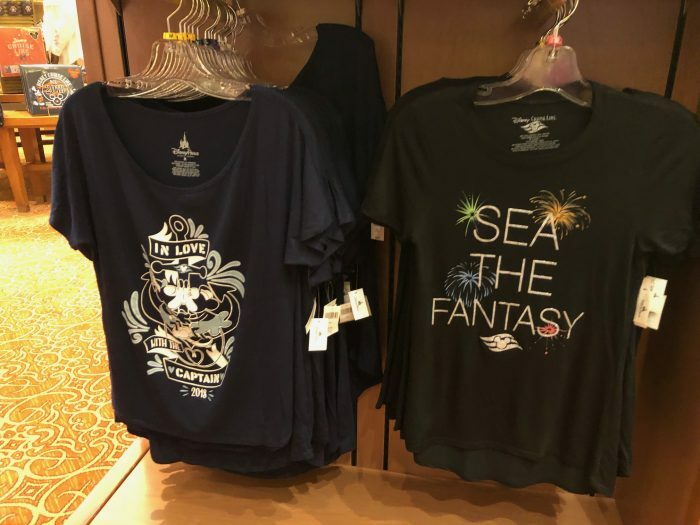 Yes, it may be a little corny, but I do like the Sea the Fantasy one. 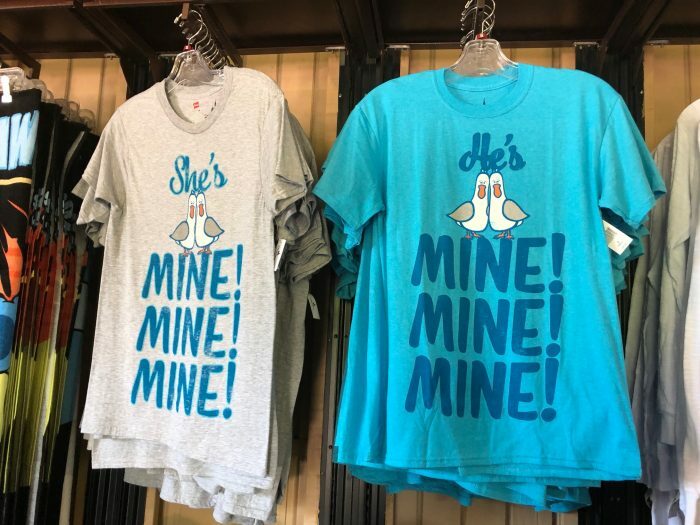 In the end, I bought the blue shirt on the right in this photo. It’s a comfy shirt, and it has sparkles. What’s not to love? 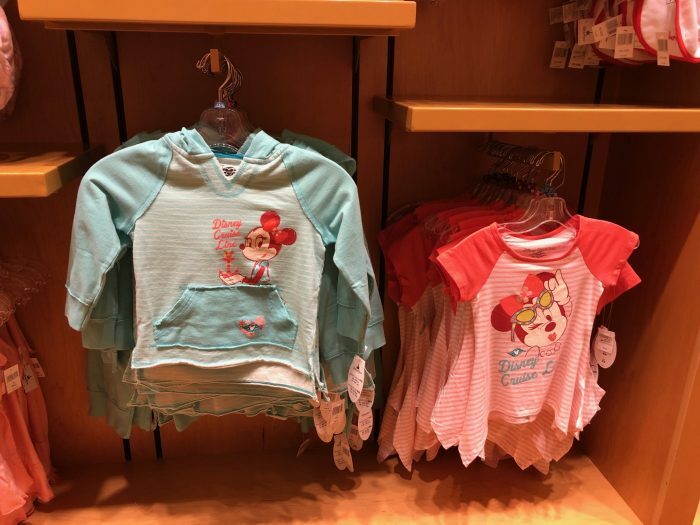 There’s plenty of clothing for all ages, including a two-piece set and a lovely Minnie shirt in blue. 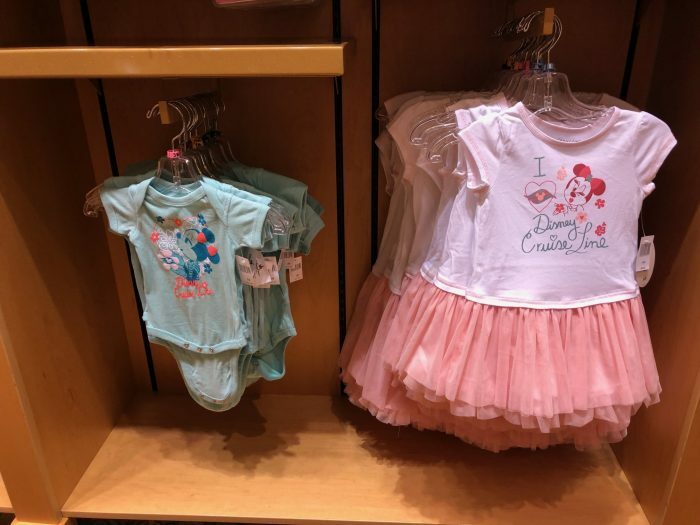 You’ll certainly see kids of all ages on board, so no surprise there’s clothing for infants and toddlers. But this one wasn’t a style I liked at all. 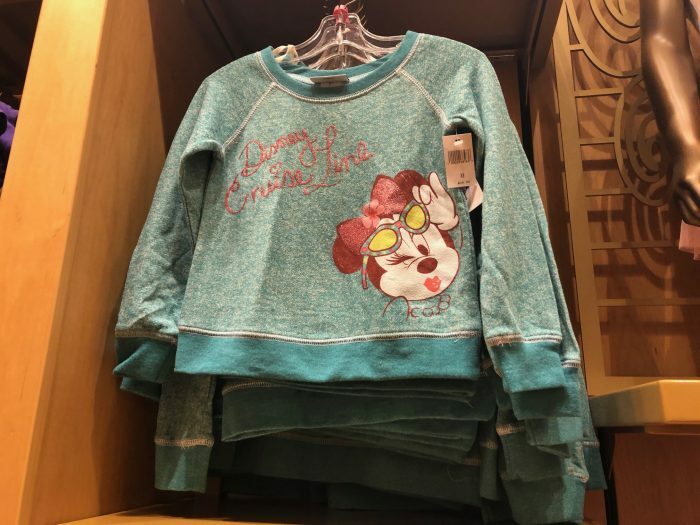 Is it the Minnie design or is it the shirt itself? Do any of you like it? 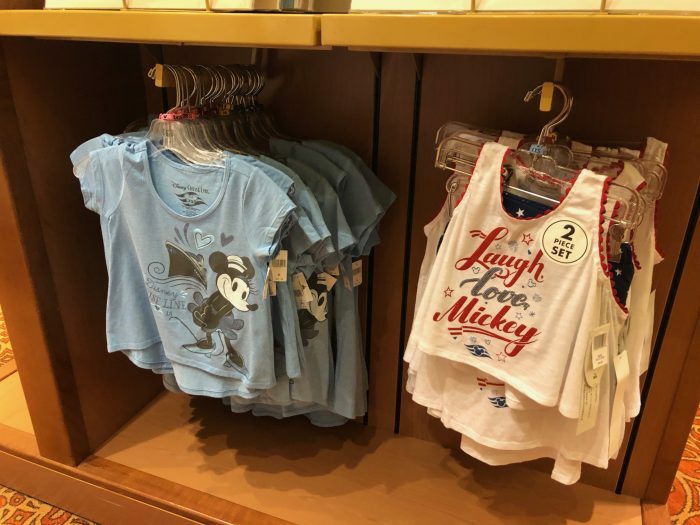 For boy’s clothing, the emphasis was on the new-style Mickey from the new Mickey Mouse shorts. 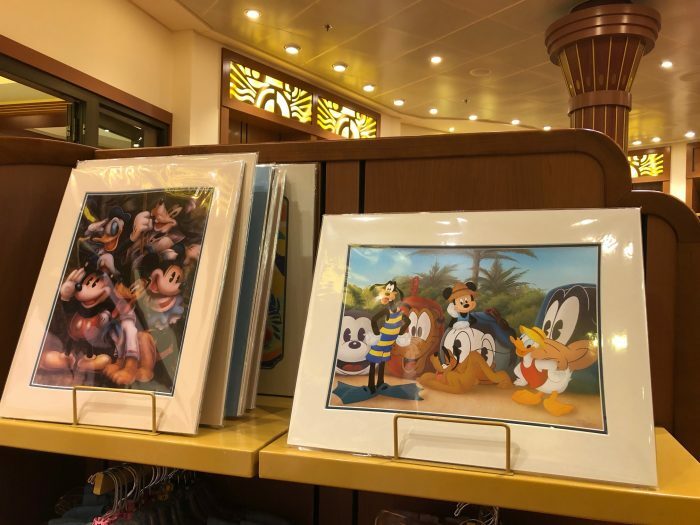 I’d love to see them do a complete short where the gang goes on DCL (beyond that one scene with Donald in Flipperboobootosis–can you tell I like the cartoons?). 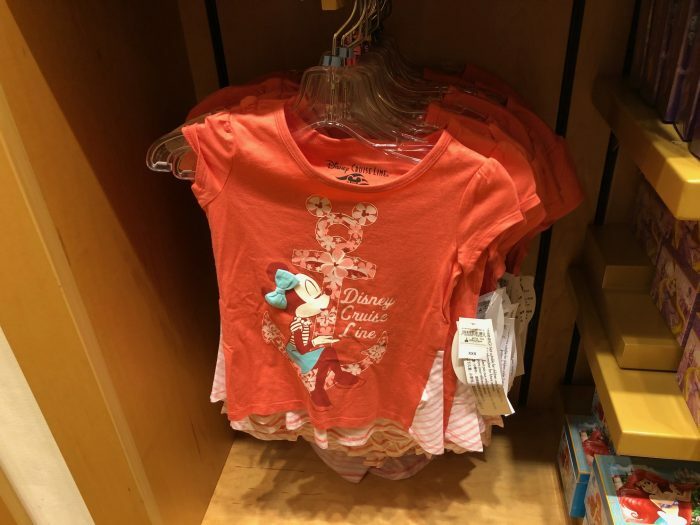 Toddler-size clothing was also available for the boys on board. 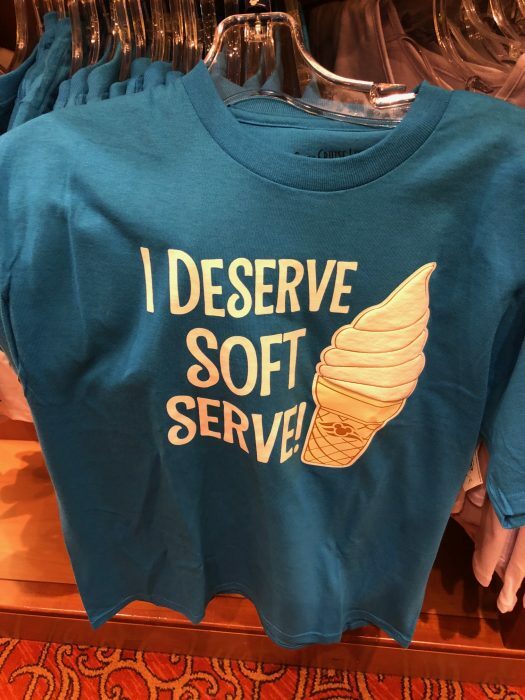 Confession time–I saw this shirt out of the corner of my eye and thought that it said something very, very different. An honest mistake, really! If you want to get your Pirate on while on board, there’s plenty of last-minute options. 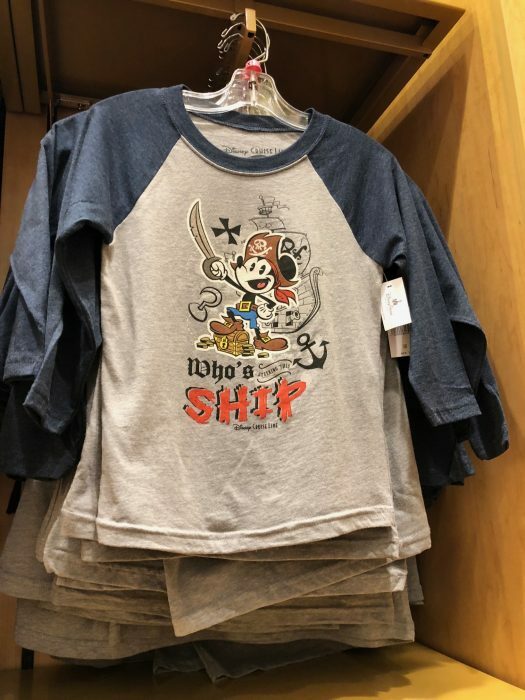 Not all of them are outright Disney-themed either, like this one that you could wear to…..your other pirate-themed parties you attend? 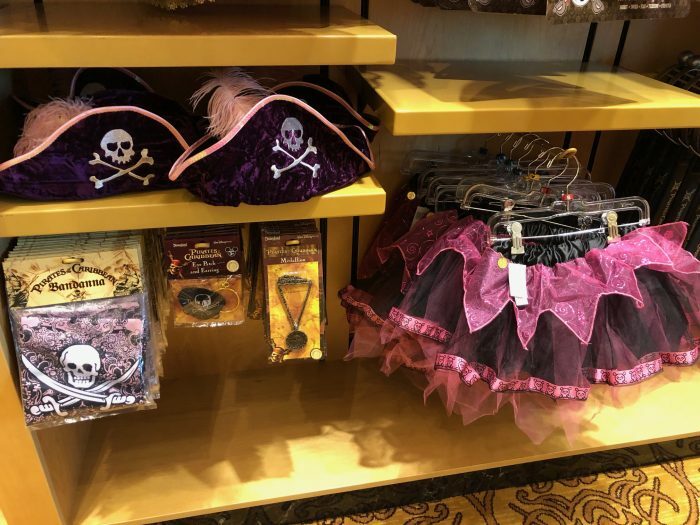 If your girl decides she wants to dress up, but you can’t get into the Pirate’s League for the full makeover, there’s still plenty of options for Disney to help for a few pieces of eight. 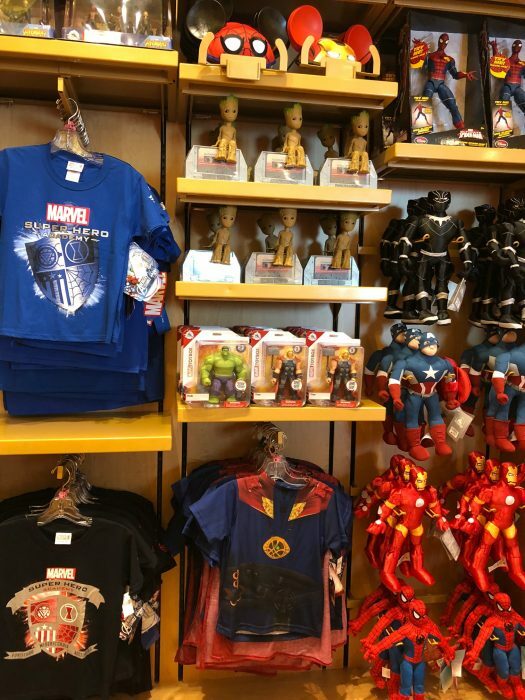 Thanks to Star Wars and Marvel day at sea cruises, and the popularity of Marvel and Star Wars movies on board, there’s an abundance of merchandise for both franchises. 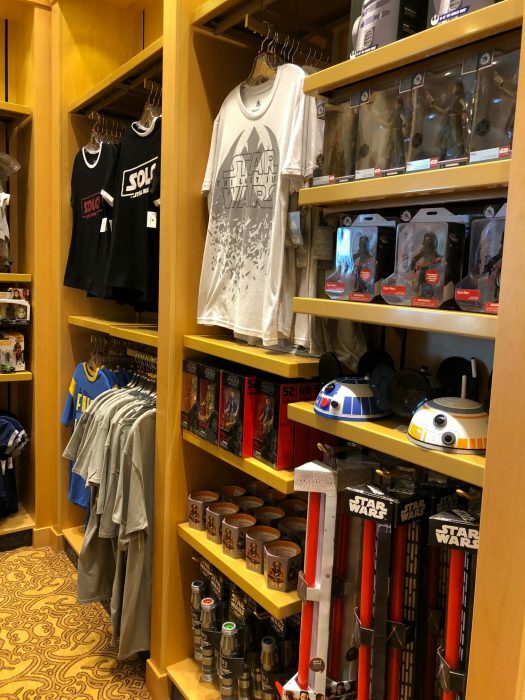 Here’s some of the Star Wars stuff…. … and here’s some of what they had for Marvel. 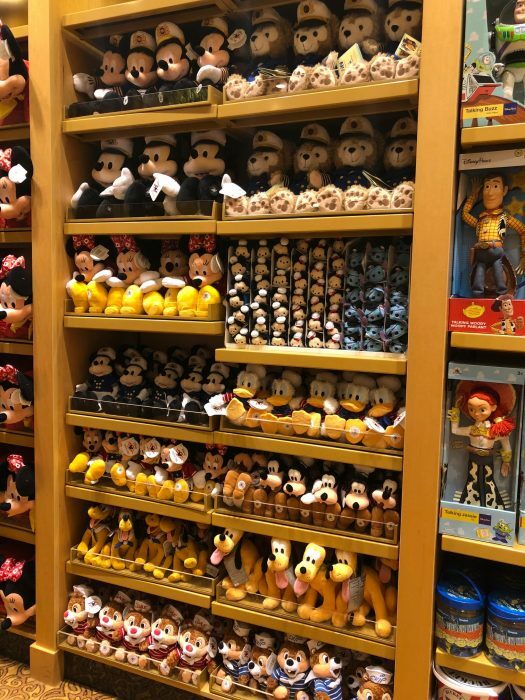 In my view, you can’t go wrong with a DCL plush or a tsum tsum, though. They make great gifts for all ages. I’m sure there’s some sort of psychological term for people who have phobias about drinking out of mugs shaped like someone’s head. 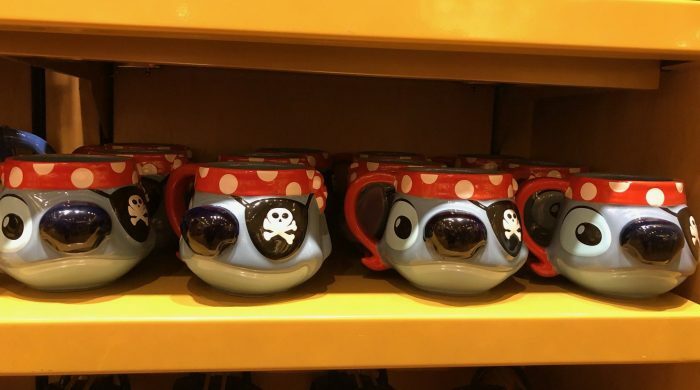 But if you don’t have that, what do you think about this Pirate Stitch mug? 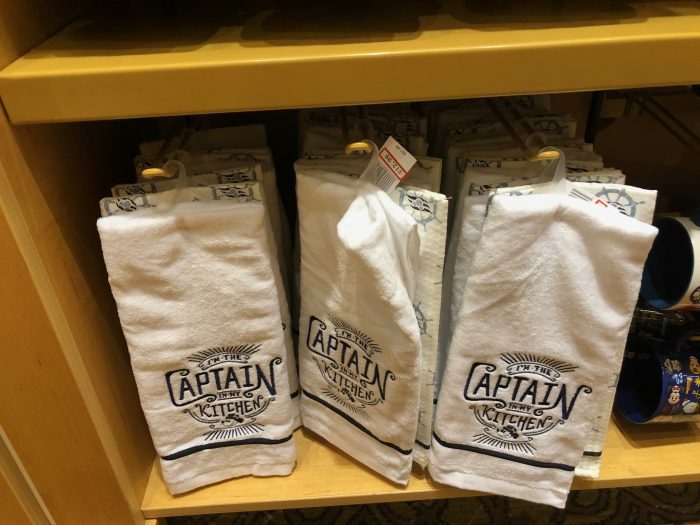 Dish towels strike me as the kind of gift you’d bring home to your pet sitter. But what do I spy there? A red tag? 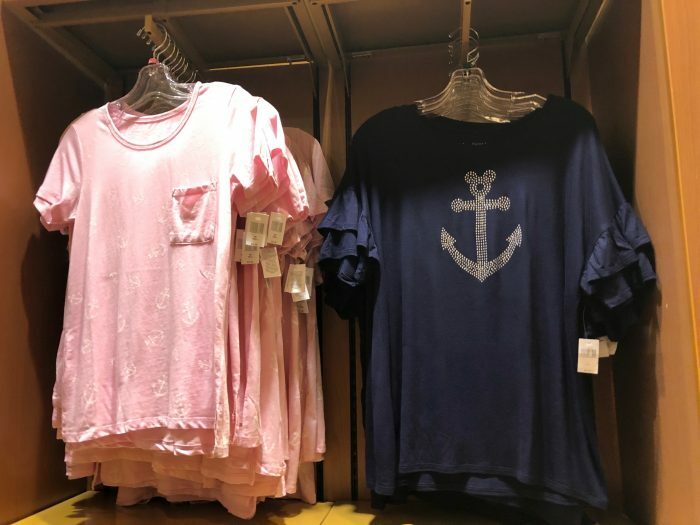 Yes, even on the cruise line, you can sometimes find items on sale before they head state-side to the Outlets. 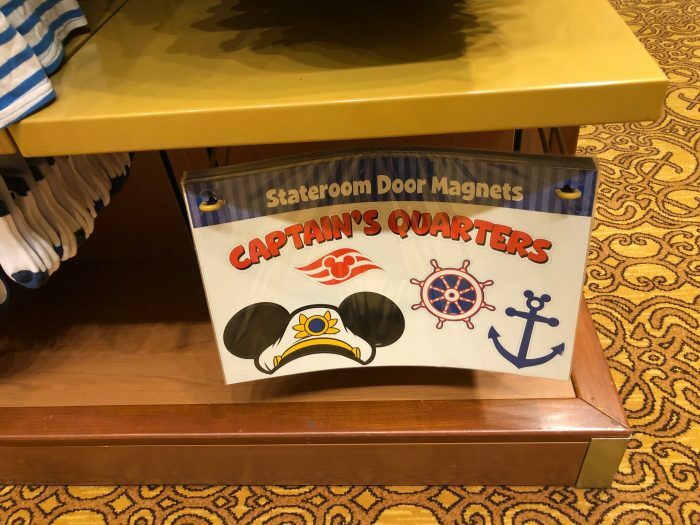 Having stateroom door magnets, whether you buy them or bring your own, can be so helpful when you try to find your way back to your room late at night when you’re so exhausted you can barely walk. Picture frames can be a great family souvenir from a trip. I do like that ‘generic family people’ in this one are Mickey, Donald, and Minnie. This frame is also pretty cute, but it feels like something I’d be more likely to DIY from Pinterest at home. Forget a bag for port shopping? 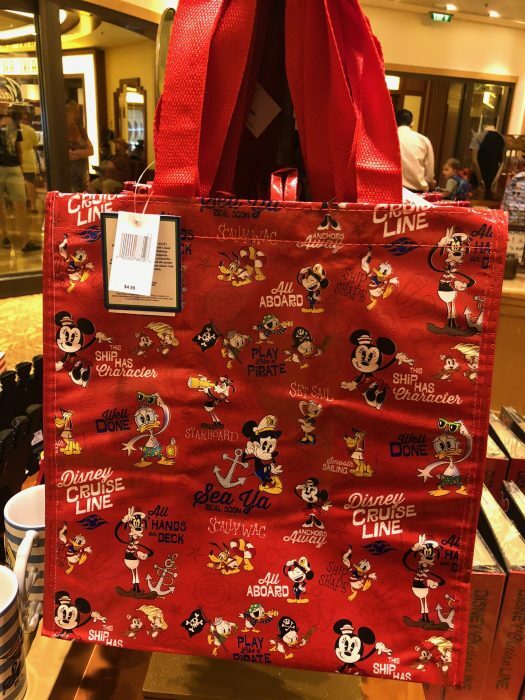 Reusable bags are available for sale in on the ship. And, when all else fails, artwork is a fun souvenir. Don’t you love the one of Mount Rustmore? Speaking of Castaway Cay, much of the merchandise was the same as my cruise last January, but this shirt was new to me. It’s very pretty, but I can’t imagine I’d get any use out of it. And now for my “best and worst”. First, the best. The free soft serve is a thing of legends on the ship. I highly recommend that we need to have accurate wait time measurements taken to help optimize when you should go for soft serve with the least line. It’s a sacrifice, but I’m willing to take some more cruises to get that data. Anyone want to send me on that research trip? Anyone? Anyone…..? And then, for the “worst”, there was this sweatshirt. 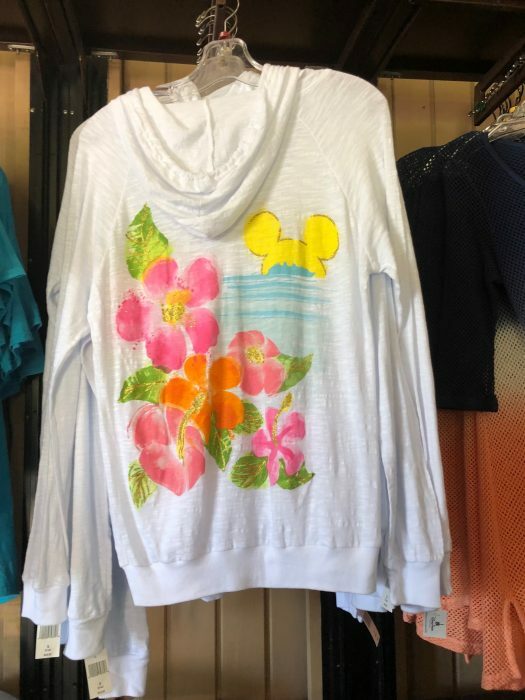 The style didn’t work for me, and I don’t really know who is buying all these sweatshirts in July in the middle of the Caribbean. Am I missing something? If so, let me know! That’s it for this month’s round-up. 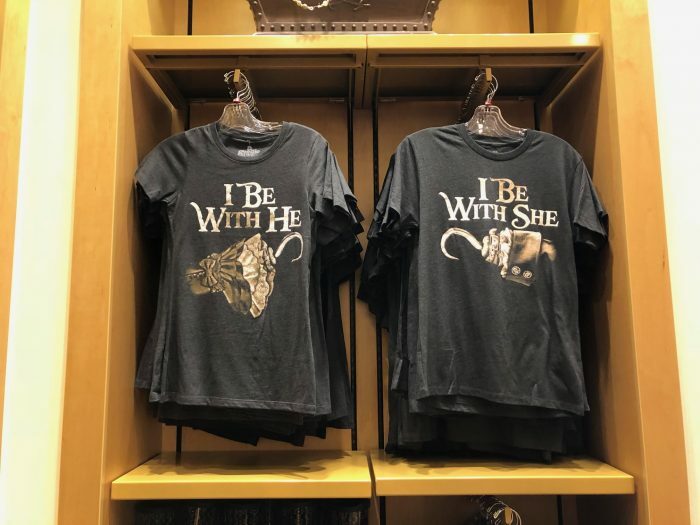 Got merchandise you’d like me to report back on? Have a park you want me to visit? Let me know in the comments. 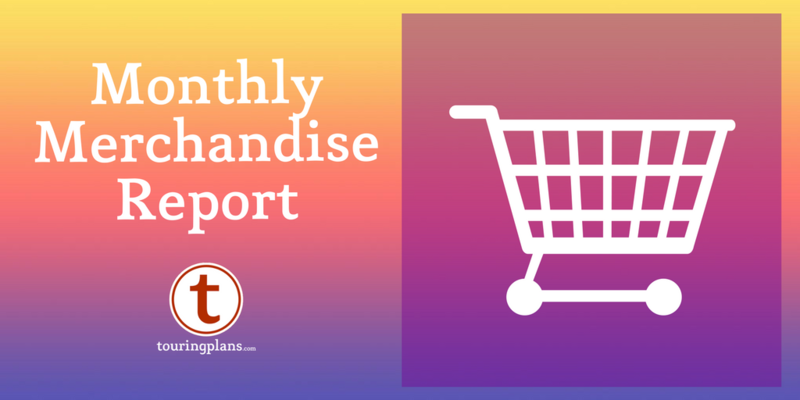 Thank you for the merch report! 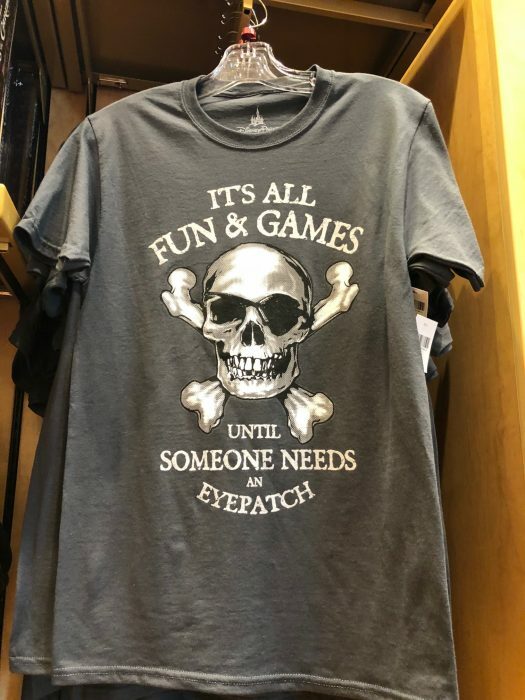 I love that “until someone needs an eyepatch” shirt.